Keep calm and put your jammies on! A party that doesn't require you to scratch head to think of what dress to wear but just to put on a comfy pajama of yours! 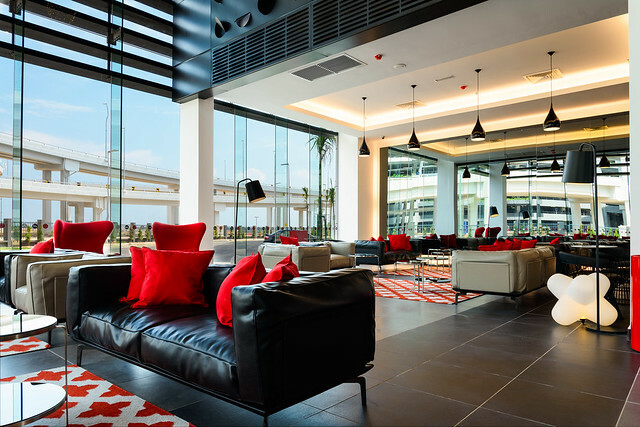 The best part here, we're not only going to enjoy the party, but also enjoy a stay at the new Tune Hotel KLIA2! I was quite surprised with the modern interior concept of the hotel lobby itself, simple yet stylish! To add to the guest experience and comfort, the hotel's spacious lobby features a cool, casual seating lounge with free wifi and an expansive open-air courtyard lounge, overlooked by a 24-hours restaurant and beverage centre. 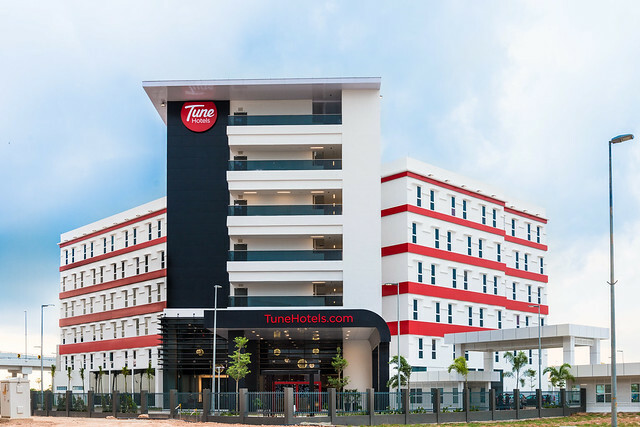 For guests with further transportation needs, the hotel includes a transport counter for overland transport needs and for flights, two AirAsia self check-in kiosks and KLIA2's flight information displays are provided within the lobby for added convenience to hotel guests. After going through the check-in process, we were given the key to our room. The room featured a modern-style interior setting with a clean and comfy double bed, a sleek writing table, luggage platform and a 32-inch flat screen LED TV. Unlike the other Tune Hotels, the room rates are inclusive of towel, toiletries, air conditioner, TV and wifi in your room. Yours truly totally enjoyed the one night stay, showered with high-pressure heated shower and hair dryer provided in the bathroom too! The pajama party was held in the open-air courtyard lounge and it was furnished with comfort and colorful beanbags for the guests! Oh! There's a huge giant Jenga game for the guest party to play with! It was so huge that it either you can easily put it on top or maybe collapse it with a wrong move. It was getting more and more challenging by the night time! 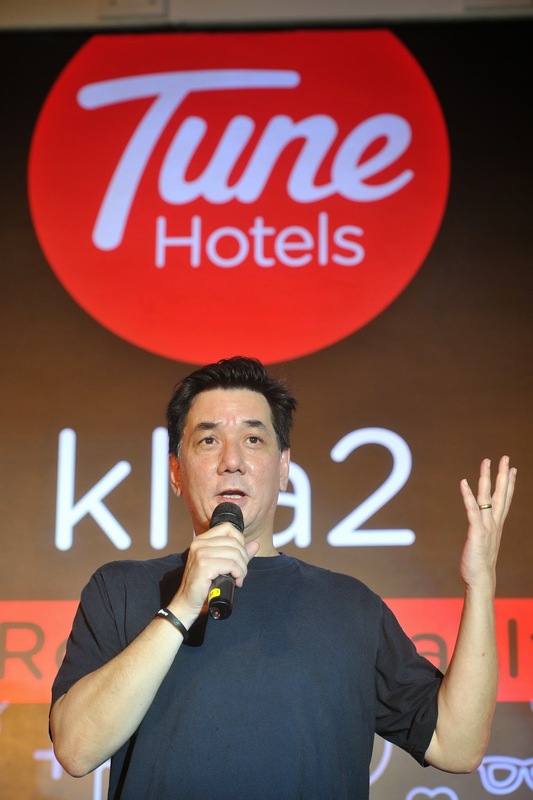 On top of that, he said, guests at Tune Hotel klia2 enjoy great connectivity to KL city and its surrounding suburbs as the klia2 Terminal boasts not only bus and taxi services but also the Express Rail Link (ERL) train service that connects to and from Kuala Lumpur Sentral. For guests arriving at or departing from the KLIA Main Terminal, they can make use of the scheduled shuttle service via the ERL that costs just RM2 one way and stroll over to the hotel via its covered link bridge. Guests not only gets to enjoy playing the game, face painting session and foods, but also well entertained by the performance of award-winning recording artiste and singer-songwriter Melissa Indot, YouTube sensation Elizabeth Tan and Tune Hotels’ very own Eugene See. You can easily spot guests are putting effort on dressing in the best pajama outfit to win something huge from Tune Hotel! Who is the winner of the Best Pajama outfit of the night? After the round of the catwalk show of the nominees, here you go the winner! The winner won himself a trip for two to Melbourne, Australia and a 5D4N stay in Tune Hotel Melbourne. We had so much fun at the pajama party and decided to check out the KLIA2 shopping mall after the party over. Just so you know that the hotel is directly connected to the new Kuala Lumpur International Airport 2 (KLIA2) Terminal via the covered walkway and link bridge, allowing easy and more convenient access as well as the gateway @ KLIA2 Shopping Mall.